Welcome to Clay Hill Lodge on the beautiful Rogue River in Oregon. 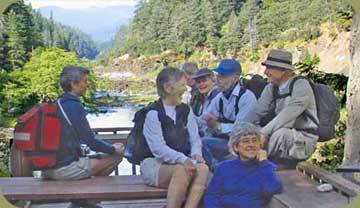 Accommodations for Family Getaways, Rogue River Hikers, Bird Watchers, Wild Flower Enthusiasts, Photographers, Whitewater Rafters, Kayakers, Steelhead and Salmon Fishermen. Your host for special events such as family reunions, holidays, corporate retreats, honeymoons and anniversaries. The Rogue River carves its way through the Siskiyou Mountains, some of the most rugged, inaccessible and biologically diverse country in North America: the National Wild and Scenic Rogue River Canyon. 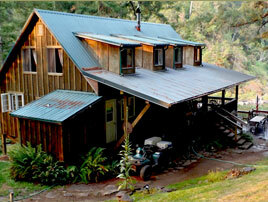 Deep in the heart of the canyon is the Wild Rogue Wilderness Area, home of Clay Hill Lodge. Surrounded by virgin wilderness and six miles from the nearest road, the main lodge features a commanding eagle's nest view of the river and canyon. Photos cannot convey the raw, natural beauty and overwhelming sense that here everything is right. Join us for an experience to last a lifetime, or as most of our guests discover, to be repeated again and again. View black bear, deer and river otter from our spacious decks. Watch osprey dive for fish or launch mid-air battles against eagles flying too close to their nests. Wet a line for one of the three varieties of steelhead or two species of salmon. Shoot the rapids, explore the ecology of the forest or just relax and read a book. We provide wilderness lodge accommodations for your needs, but please remember we are off the grid and in a remote location. Reservations must be made in advance due to the planning necessary to assure you the best vacation experience. All of our food comes in by jet boat, so please plan ahead. Rooms have private bathrooms with showers. Clayhill Lodge is now offering fly fishing trips for Steelhead and Salmon. The rugged and inaccessible canyon of the Rogue River Wilderness from Blossom Bar to Watson Pool is epic steelhead and salmon water. Clay Hill Lodge is right in the middle of it. 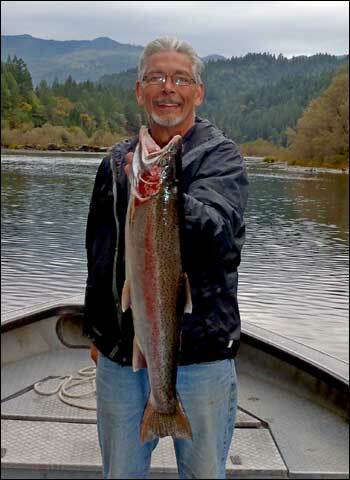 Our lodge is the only permitted motorized fishing outfitter located within this stretch of the Rogue River. 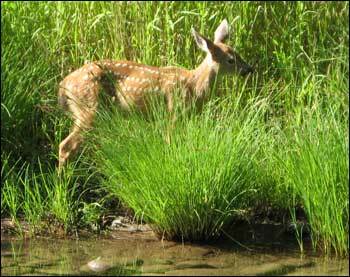 Here you share your fishing holes with bear, osprey, eagles and blue heron, not fishermen. Join us on your next fishing adventure in comfort at Clayhill Lodge. Thanks for a wonderfully relaxing time at your lovely lodge. The careful attention to detail, the great food, good conversations, and the black bear sightings were all part of a true comfortable wilderness adventure."